Professor Ana Rodriguez speaks softly as she remembers a time 20 years ago when she was an elementary school English teacher in her hometown of San Juan, Puerto Rico. She sits in her office and leans back in her chair as she thinks. As her memories begin to come back they bring a warm and reflective smile to her face. In her free time, Rodriguez also led a handbell choir filled with students of all ages from around the community. Rodriguez was taught to play the handbell by her parents when she was a child. When she became a teacher, she shared her musical knowledge with her students who were eager to learn. One of Rodriguez’s students, a middle schooler named Juanito, holds a special place in her heart. Juanito desperately wanted to learn the guitar so he could play a song for his older sister’s graduation. So he asked Rodriguez if she could teach him. “I didn’t know how to play the guitar,” Rodriguez said with a laugh. But she agreed anyway, signing up for classes at a local university while working full time at the elementary school and teaching the young boy on the side. Thanks to her love to see others learn, Rodriguez performed a musical number alongside Juanito for his sister’s graduation. Though time has passed, Rodriguez still remembers that little boy from Puerto Rico as wearing a constant smile on his face. She remembers his passion for learning and she can’t help but smile to herself as she talks about his progression as her student. Rodriguez’s love for teaching students is still as it was 20 years ago. Now she is a professor of education at Eastfield College, where she teaches a learning frameworks class. Perhaps one of the best-known qualities of professor Rodriguez is this infectious love that she has to see students grow. Scattered around Rodriguez’s office are small mementos from her students. Rodriguez speaks about one student who decided to pursue a career in criminal justice, and how she created a small forensics bag. Rodriguez holds the bag up and speaks with pride about her former student. “Her motivation to pursue her degree has increased exponentially, to the point that she is looking ahead at things in her profession,” Rodriguez said. Another student’s graduation picture sits on a desk next to her. Rodriguez met this student in the math spot during the first year she came to teach at Eastfield. Rodriguez had volunteered to help tutor math even though she wasn’t a math professor and while teaching this student developed a lasting friendship with her. 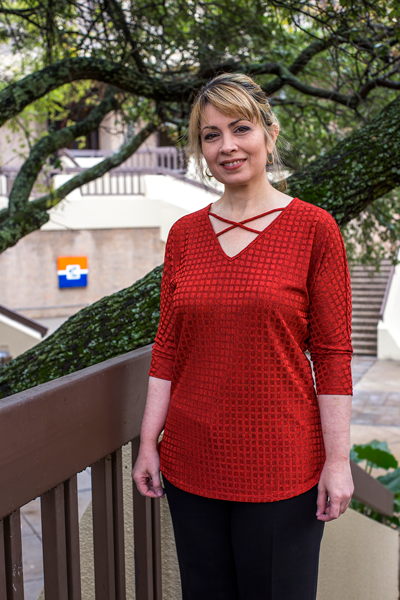 When Rodriguez came to Eastfield in 2010, fellow professors noticed the loving and personable qualities that Rodriguez has. Psychology professor Myesha Applewhite is one professor who has worked closely with Rodriguez. “The first time we met I noticed that she was kind, intelligent and very collaborative,” Applewhite said. Both professors have worked together to develop online resources and classes, which Applewhite said can be difficult. English professor Shazia Ali has observed Rodriguez’s personal touch when teaching. “Students like her, the way she speaks to them and approaches them is very personable,” Ali said. Another former student of Rodriguez, Eastfield graduate Josh Nelson is impressed with his experience as her student. “Ana Rodriguez was an excellent teacher,” Nelson said. Nelson said that the overall lesson that he learned in her class was direction and self-control. “You are the only one that can command your life,” he said. A couple of years after Rodriguez helped Juanito learn the guitar, the student invited her to a high school orchestra performance at Bellas Artes, a performing arts center in San Juan. Rodriguez sat on the second floor in what she remembers was a packed house. She watched Juanito play in almost all of the musical numbers with different instruments. He and his classmates were performing alongside the Orquesta Sinfonica de Puerto Rico. After the show, Rodriguez remembers seeing Juanito all grown up and still smiling. What does a life devoted to teaching look like? For Rodriguez, it is the moments like these that draw the most joy for her. And inside these memories, a clear picture is drawn of the purest love a teacher can have for their student.